Here is a list of the apps I use on my phone or tablet for work purposes. This will probably not be complete, but the most used. As you can see the list is extensive and doesn’t cover CRM programs, payment collectors, Invoice makers, etc. Those we’ll look at later. Lets look at a few of these in depth. CamCard is the most used app other than my phone. 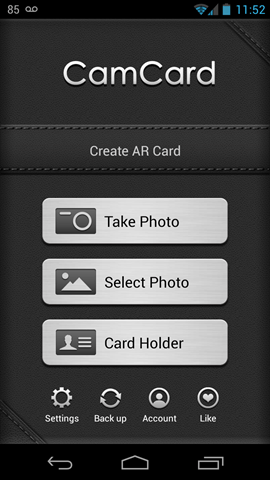 I tested a lot of business card capture apps a few years ago and this was the run-away best. After snapping a picture of the card, it enhances it for easier reading, automatically crops the image to just the card, and runs OCR (Optical Character Recognition) on it and places the information in the fields. Like most OCR programs, it doesn’t handle graphics well, especially with the company name is only represented by a graphic. It is easily editable for any errors it makes, then when you save it, you choose where. I set mine to save in CamCard and my Gmail contacts (People app). This provides a backup of all my contacts. Another feature I like is the “note” tab. I can document actions with a suspect, prospect, or customer. I date the note and record the action. This also syncs with the notes field in Google Contacts. Again, redundant backups (yes, I’ve lost information and am a bit paranoid). CamCard also provides a free cloud backup service that allows you to sync the contacts across multiple devices. This is handy for phone and tablet continuity. It does not matter which device I capture the card on, it shows up on both. CamScanner is made by the same company and works much the same. Snap a photo, it automatically enhances and crops the document and allows for OCR, if you like. The reason I’m impressed is, I can take a picture of a 8-1/2” X 11” document and the quality is such, I can zoom in on the fine print at the bottom and read it clearly. I use it to capture a printed document containing signatures for email and storage. I have and still use a lot of different to-do apps, but I have stuck with this one the longest. It is easy to use (once you figure a few things out) and works as needed. I think enough has been said about Evernote to fill many books, so I’ll just say it is the brain that never forgets. There are more applications listed than time prohibits me going into a lot of detail in this one article, but I will later. This video is the first I’ve ever done shooting a demo from a mobile device. I noticed several issues with the video, and with time would see about re-recording it, but it will do for a first effort. They will get better with time. I like tablets but more i love computers, the simple fact that i can browse and work faster with a PC. Tablets are for multimedia only, i thnk.